2019 top 10 4K drone cameras capable of capture 4K UHD footages. Solution to free download drone videos 4K from YouTube, or upload recorded drone 4K videos to YouTube to share with the world. If you are looking to record some great drone 4K UHD video of your surfing, skydiving, snowboarding, bungee jumping, extreme sports or anything else, this post covers 2019 best 10 4K (DJI) drone cameras for you to choose. 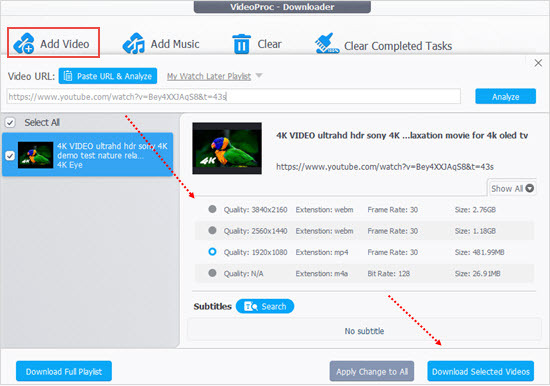 Also, a useful tool is also provided to help you free download any favorite drone 4K videos from YouTube and 300+ video sites, as well as edit, convert, compress the large drone 4K video to upload and share onto YouTube or other social media. • Free download drone 4K videos, 1080p/720p videos or any other videos, movies, MP3 songs from YouTube, Vimeo and 300+ sites. • Convert drone 4K videos or any other camcorder/camera videos like HEVC, MKV, AVCHD, MOD to MP4, AVI, etc. at ultrafast speed with Intel QSV and Nvidia CUDA/NVENC GPU hardware acceleration. • Edit video. Trim, crop, merge video. Add subtitles to video. Freely adjust video/audio parameters incl. resolution, frame rate, bit rate, tec. Here we collect top 10 drone 4K video cameras 2019 incl. some best DJI 4K drones and some reasonably cheap 4K drones. Check their specs, video formats, video camera resolutions, flight time, price, etc. below. You may find many marvelous drone 4K videos on YouTube, Vimeo, etc. If you want to download drone 4K videos for free from YouTube to your computer, check the fast and easiest way. WinX HD Video Converter Deluxe is a professional video downloader & converter for Windows (10). Its video download function is totally free. You can use it to free download drone videos incl. drone 4K/1080p/720p videos, any other 8K/4K/HD/SD videos, movies, TV shows, as well as MP3 songs from YouTube, Dailymotion, Vimeo and 300+ sites at superfast speed. Free download WinX HD Video Converter Deluxe on Windows 10/8/7, etc. and follow the 3 steps below to easily free download (DJI) drone 4K videos from YouTube, etc. with original quality at fastest speed. 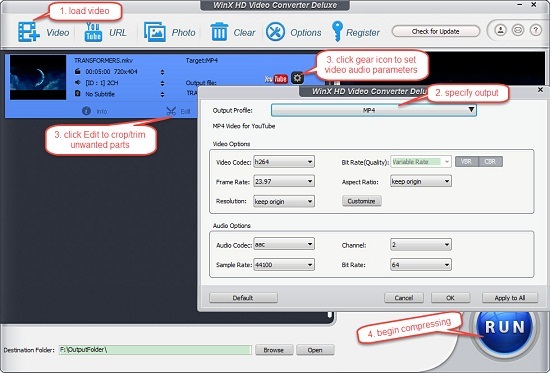 Launch WinX HD Video Converter Deluxe and click "YouTube URL" button. Go to YouTube or other supported video sharing sites to open the drone 4K video you’d like to download. Open and play the video. Copy and paste the (DJI) drone 4K video URL to the address bar. And click "Analyze". This software will grab the 4K drone video in a few seconds and display the detailed video information. Choose a preferred video format/resolution like 4K MP4. You can also select any other available resolution/format based on your needs. Click "RUN" to start free downloading (DJI) drone 4K videos from YouTube at ultrafast speed. To share the recorded drone 4K videos onto YouTube or other video sharing sites, you may need to edit, convert or compress the video. You can also easily realize this task with WinX HD Video Converter Deluxe – the best video converter & editor for Windows (10). 1. Convert 4K/HD videos MKV, HEVC, M2TS, AVCHD, MOD, camcorders/(DJI) drones videos, etc. Unique: Support Intel QSV and Nvidia CUDA/NVENC hardware acceleration to deliver ultrafast (drone) 4K/HD video conversion speed. 2. 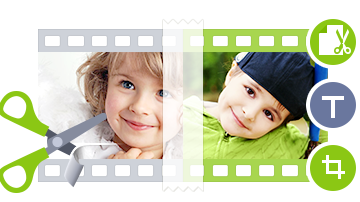 Convert MP4, AVI, MPEG, WMV, MOV, VOB, FLV, RMVB, WebM and more from one format to anther with original quality. 3. 370+ output video/audio codecs and 410+ device profiles are provided. 4. Trim clips of 4K drone video, crop or expand the video, merge several videos into one, add external subtitles to video. Free download and install WinX HD Video Converter Deluxe and use it to edit, convert drone video for uploading to YouTube, etc. Open the drone (4K) video converter & editor and click "+Video" button on the tool bar to import original (DJI) drone 4K video. HEVC/H.265 drone video is also supported and this software can quickly convert HEVC to H.264 with its built-in hardware acceleration tech. Select MP4 or any other format supported by YouTube in the Output Profile window. Click "Edit" button and tap "Trim" to trim any favorite part of the drone 4K video. Best all-in-one (DJI) drone video editing software, video converter and downloader allows users to edit drone (4K) video/footage, and convert video to MP4, AVI, WMV, FLV, MOV, iPhone, iPad, Android, etc. Also help users to free download any 8K/4K/HD/SD or VR videos/movies from YouTube, Dailymotion, Facebook and 300+ video sites.